We've all seen them on eBay; sometimes even bought them ourselves, hoping to be able to polish out the worst of the graunch marks. It's one of my pet peeves, the way some ham-fisted amateurs and even 'professional' high street jewellers manage to ruin case-backs. I saw this one - the gouged-up case-back of an only average condition gold-tone 7A38-7260 listed by an Italian eBay seller, last night. Indeed, George .... or thanks now to the efforts of some ham-fisted amateur - mut il ation. I do notice that serial was "repunched".... a 4 turned into 3, or viceversa... Why would someone do that? Because this worn-looking gold tone 7A38-7260 was listed on eBay this evening by a wishful-thinking would-be Welsh seller. Hang on a minute Taffy - you only bought this watch a couple of weeks ago ! Scaling down ?? When the seller first uploaded the listing the (9) * Please scroll down for multiple high-resolution photos * were missing. But as soon as he added them, after a prompt, I knew EXACTLY which well-worn graunched gold-tone 7A38-7260 I was looking at. 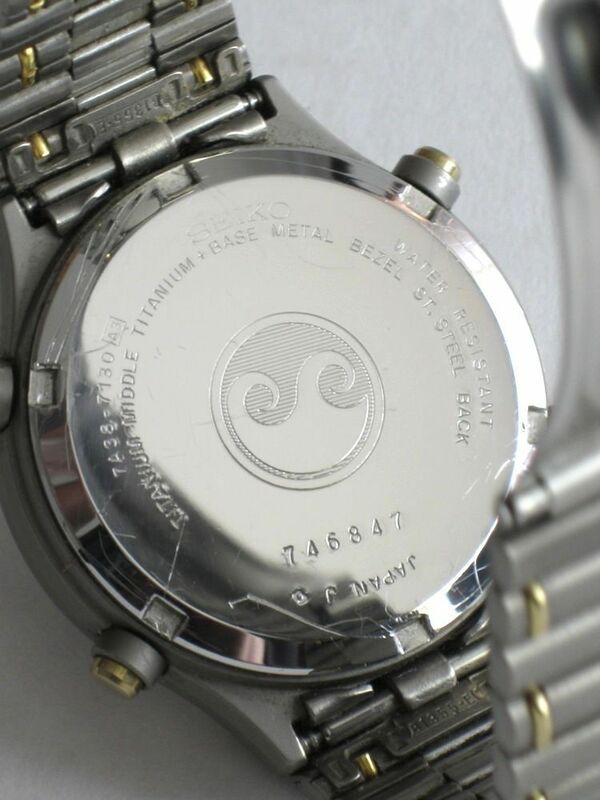 Yup it's 7A38-7260 serial number 9509x3 once again ! 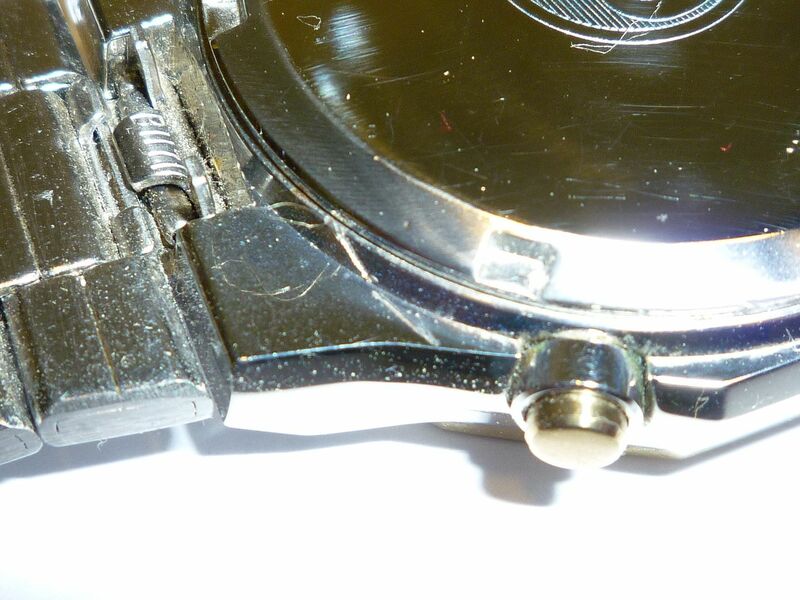 Incidentally, some of those nasty case-back graunches extend onto the side of the watch case. 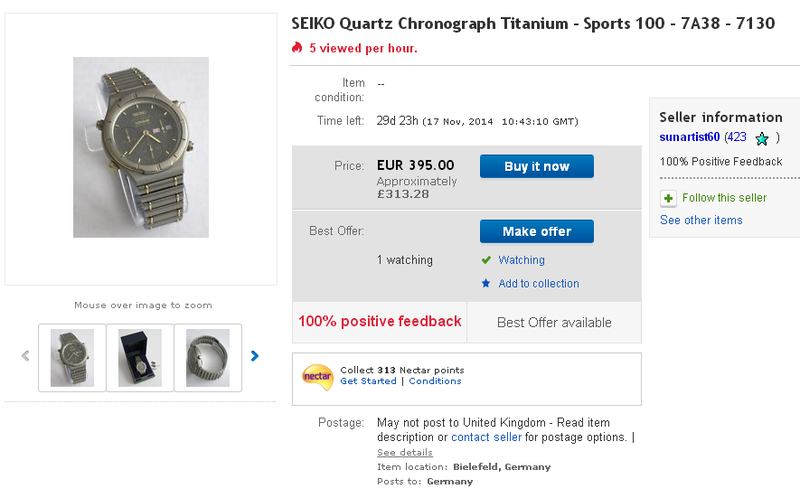 One to be avoided, at all costs - especially at that ridiculously inflated opening bid price. PS - just noticed the seller's use of the word exorbitant in his Accepted Payment Methods. Case of pot calling kettle black, methinks. I wonder which particular 'error' that was ? Without going through the description line by line, word for word, the most significant changes appear to be in the 'Condition' section. The watch comes on a brand-new aftermarket brown Croco-grain genuine leather strap. 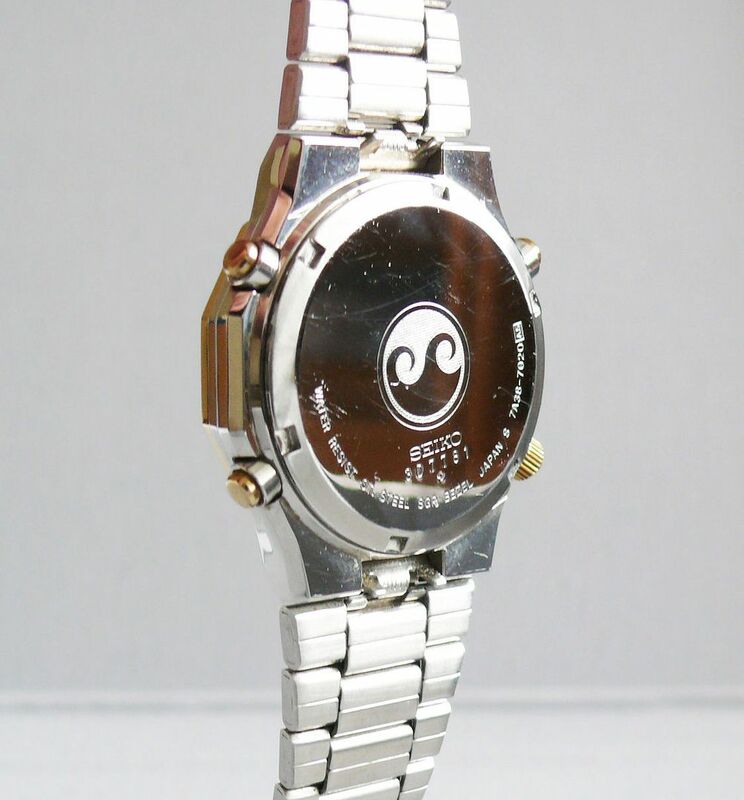 The unit Serial Number dates the production of this watch to May 1989. 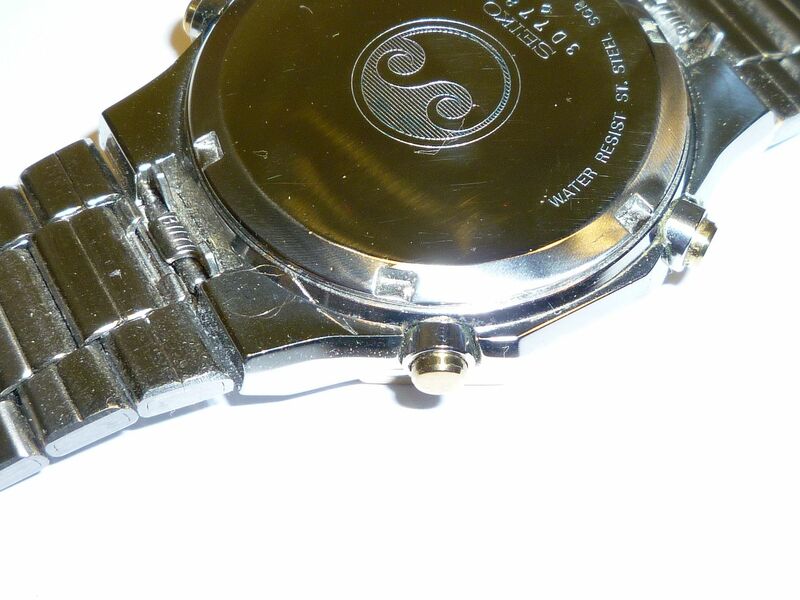 - The watch casing & crystal shows signs of use and age, with numerous scratches - no chips. 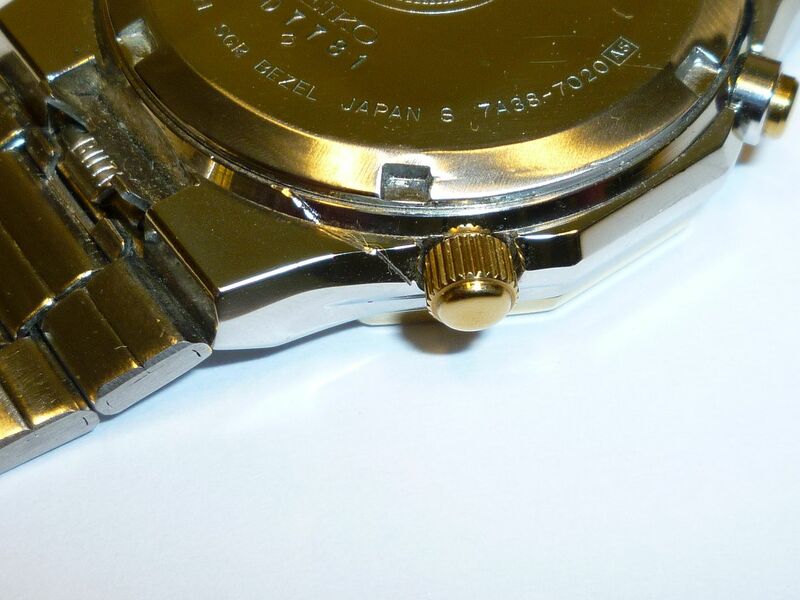 - There is minor rubbing to the gold-plating evident on close inspection. 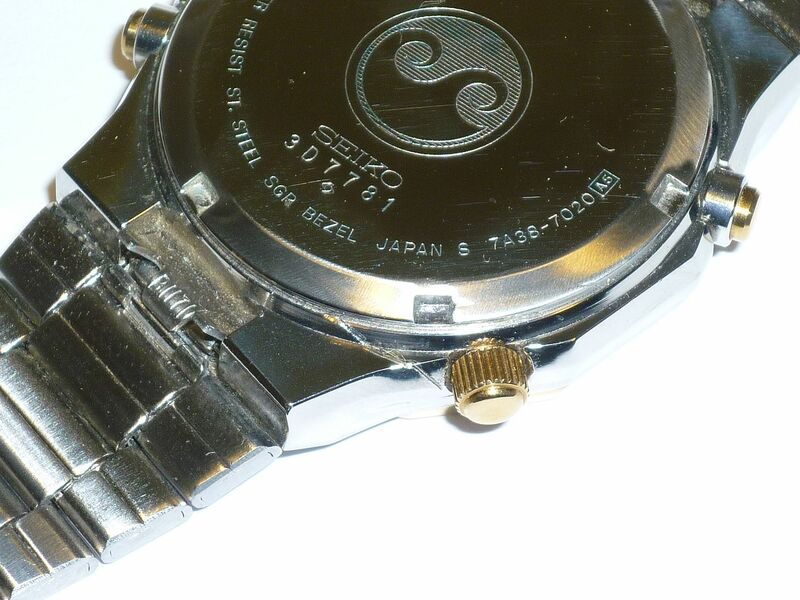 - The fifth digit of the Serial Number appears to have been damaged/restamped (?). - The watch comes on a brand-new aftermarket brown Croco-grain genuine leather strap. - In preparation for sale I have thoroughly cleaned the exterior casing with mild washing up liquid & warm water (NOT submerged) + polished with a Cape Cod cloth. It'll be interesting to see what it makes if the seller allows the listing to run the full 10 days. Somewhat less than £147.99 I'll wager. Hopefully he'll get back what he paid the previous Italian seller for it - and not a penny more. 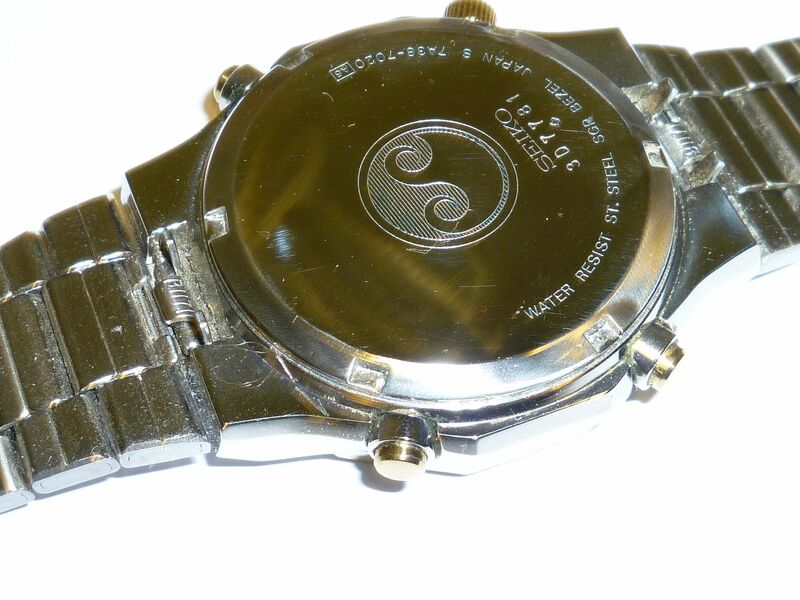 Perhaps it's partly my own fault for having promoted their virtues as a collectable watch, but there's already more than enough would-be profiteering re-sellers dabbling in 7Axx's on eBay - without another Welshman trying to jump on the bandwagon, Diolch yn fawr ! private listing - bidders' identities protected auction .... but, given the condition, I had a figure of around 50 quid in mind. Over the last 6 months, I've seen quite a few badly butchered case-backs described as 'scratched', that I simply have't had the time, or couldn't be bothered to comment on. 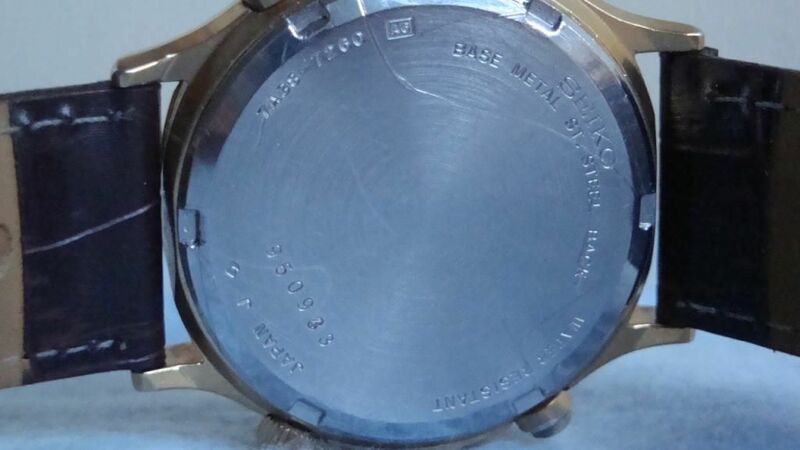 This listing for a 7A38-702H, by a UK eBay seller at the weekend, caught my eye for the wrong reasons. It's a pity the photos in his listing aren't clearer (the other two aren't worth posting). 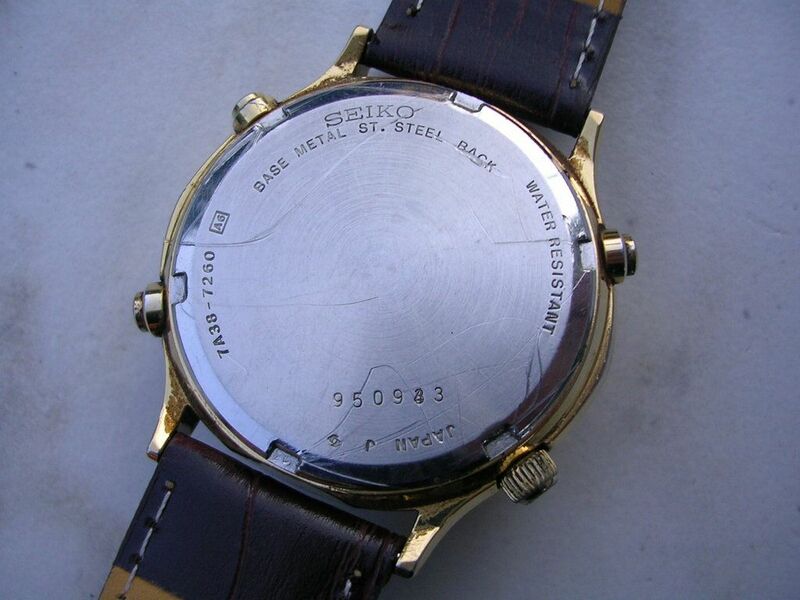 From the head-on view, this appears to be a nice example with minimal wear to the bezel's gold plating. 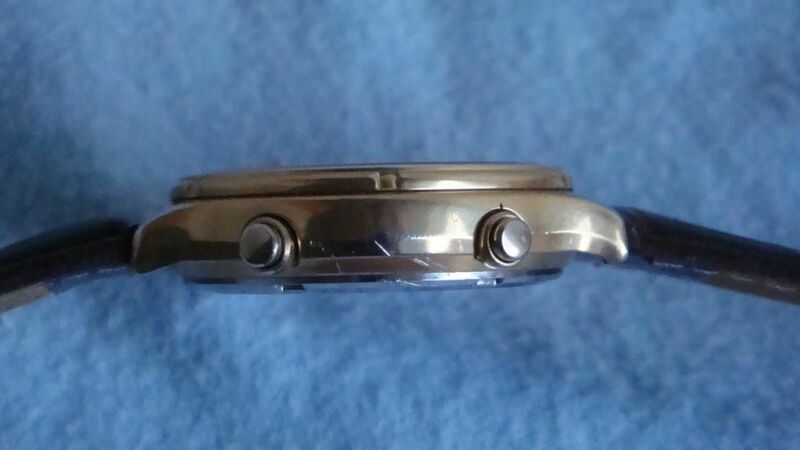 The case back has ta couple of marks due to a nasty watch maker not taking cares when replacing the battery. But just how bad is it ? 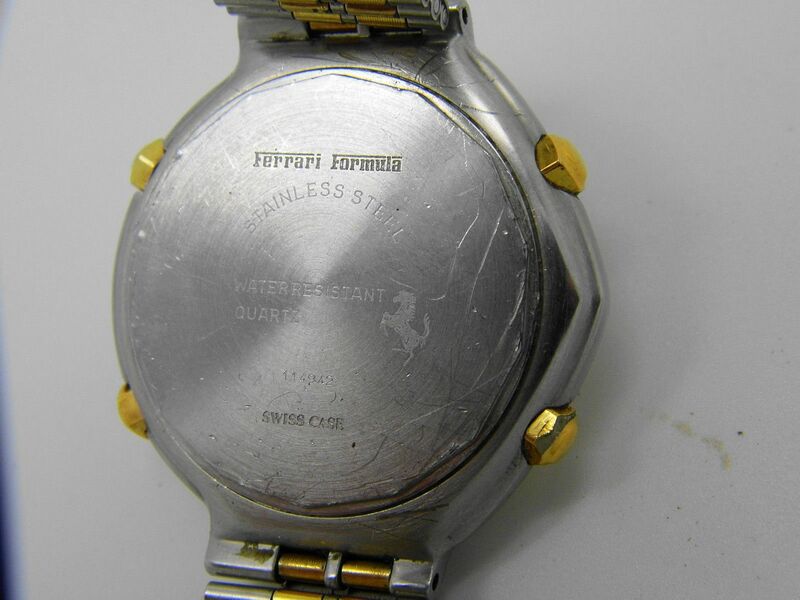 Well perhaps not a Seiko 7A38 per se, but a closely related Cartier Ferrari Formula Cal. 531 with a needlessly butchered case-back. This one listed, by a French eBay seller came up in my saved favourite search notifications this morning. It's one of the commonest two-tone dark grey dialed versions. 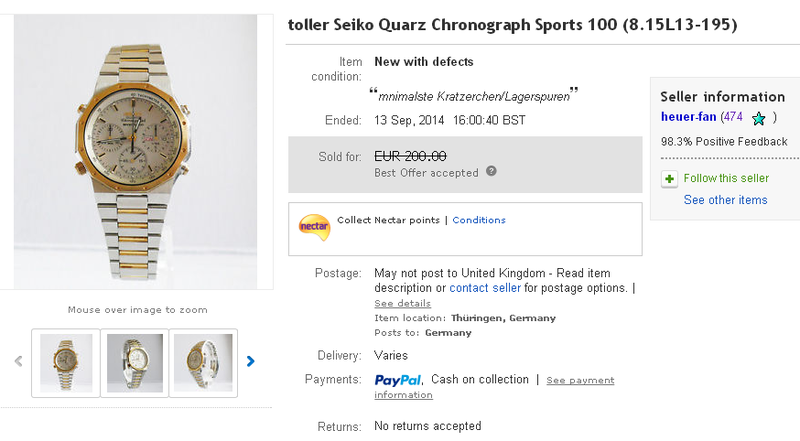 I'm the current high bidder @ 2.00 Euros ! Pity about the state of the case-back though. Investing $20 in one of these superb case-back removal tools would almost certainly have prevented all that unnecessary damage. I hate to admit it, but I've allowed myself to fall victim to a dishonest eBay seller, in my pursuit of a 'better' example of a 7A38. And a case-back butchering one at that ! I already had a couple of fairly decent examples of the two-tone grey-dialed 7A38-7020 (they're pretty common on eBay Germany) - one of them (which I've posted in the WRUW thread a couple of times) is almost mint. I should have been satisfied with that. But No. bzw. 13,70 EUR in Europa. Versand nach Übersee auf Anfrage. Bitte sehen Sie auch meine anderen Angebote ! Abholung ist nach Terminvereinbarung möglich. Viel Spaß bei der Auktion ! "minimal scratches / storage marks"
Having agreed a somewhat reduced offer price, when the seller sent me the PayPal invoice, he tried jacking up the stated postage (13.70 Euros) to partially make up his loss. I should have smelled a rat there and then. Instead, I asked him for a revised invoice. 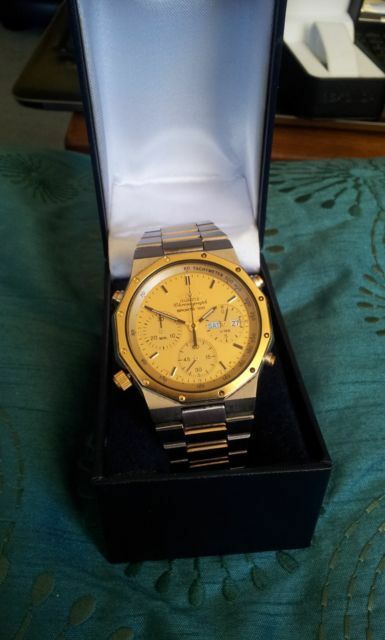 The watch duly arrived 4 days later and initially I was quite pleased. Topside, it was in better condition than my previous best example. However from the plentiful evidence of the previous owner's DNA, it was clearly anything but 'unworn'. What really pissed me off was when I flipped it over, to find that the case-back had not only been butchered (presumably with one of those 2-prong adjustable tools), but someone had skimmed the perimeter of it in a lathe, in an attempt to hide the slipped tool marks. 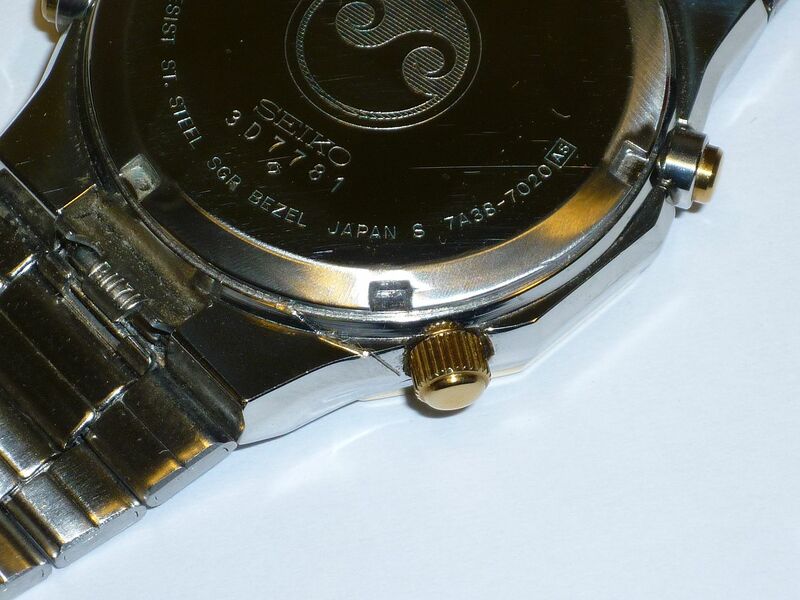 Unfortunately there wasn't much they could do about the gouge marks that extended onto the watch case. The eBay seller just sent me a message asking why I'd left him a negative feedback. I wonder why ? Maybe I should have done, Don. Right now I have the satisfaction of having left him a fairly scathing negative feedback, which is obviously bugging him considerably. He's already offered me an (unsolicited) partial refund of 50 Euros (presumably in the hope that I'll retract / modify the feedback). 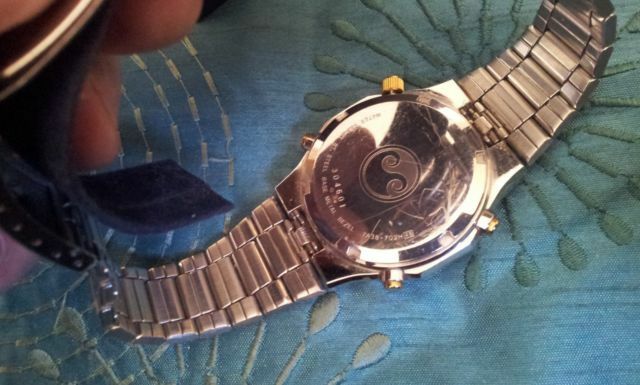 But as I told him in my last reply - that's not going to repair this ruined watch case. Here's another prime example of a badly butchered case-back on a 7A38. Schöner und gepflegter Zustand! Rückendeckel hat leider Kratzer am Rand außen. Details siehe Bilder. translate as: Beautiful and well-kept! Unfortunately, back cover has scratches on the edge of the outside. Details see pictures.